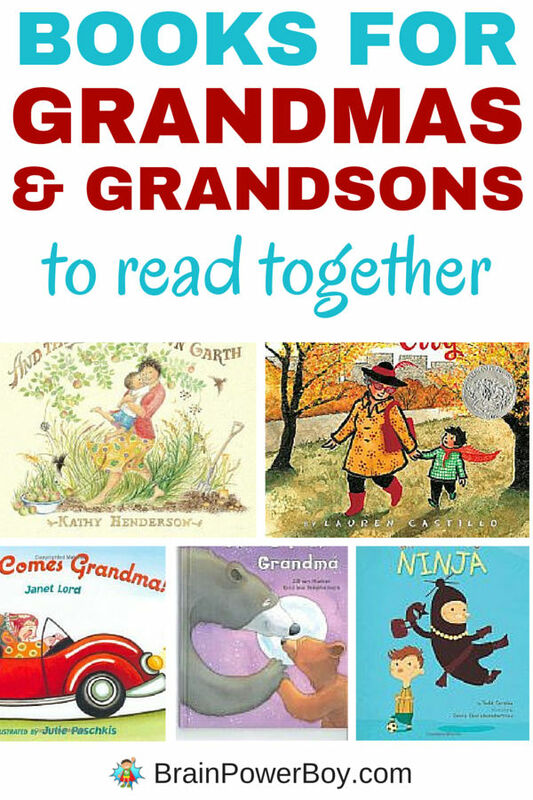 Here is our Books for Grandmas and Grandsons to Read Together book list. We did a collection of books for mothers and sons and I thought it would be lovely to do a list for grandmothers as well. These books make wonderful gifts for either grandma or a young boy. See our hand-picked selection below. If you are looking for other books for boys be sure to see our page with all of our best books for boys lists. When my son was young I really liked having other people read aloud to him. Not everyone reads a story the same way and I felt it was such a nice way for him to bond with others. Reading with grandma was always a treat! I Love You, Grandma is a short and cute book about a boy and his grandma. Little bear has a lot of questions and grandma does her best to answer them all. Here is a sweet gift book for a grandma to give to her grandson. Grandma Loves You! has a spot for the child’s name, a picture of grandma (or grandma and grandchild) and a letter from her in the back. Grandma Loves You Because You’re You shares the story of a fox grandma and grandson spending the day together. From pancakes in the morning to other special activities, this touching books is all about love and building memories. This was a favorite in our house. What Grandmas Do Best is a two-sided book and comes with What Grandpas Do Best on the back. These are fun. The animal illustrations are colorful and give some lovely ideas for spending time with grandma. Here Comes Grandma! and this is no ordinary grandma! Lovely folk-art style illustrations and a lively grandma showing all the ways that she would take to get to her grandson make for an enjoyable read that will let kids know their grandmas will go out of their way to get to spend time with them. Grandmas who lived or live in the city will enjoy this title: Nana in the City . A young boy is rather nervous about visiting grandma in the big city as he thinks it may be rather scary but grandma takes him on a trip through the city and helps him overcome his fears. I love the charming watercolor illustrations. Here is a funny one for you all. Grandma Drove the Garbage Truck is a romp through town with grandma driving the truck and her grandson helping her. Grandmas is making as much of a mess as she is cleaning up! For boys 4+ this one is a winner. My Grandma’s a Ninja . Picture a ninja grandma in pearls and you get an idea of the type of book this is. It is amusing and has a good message about loving each other for who they are. And the Good Brown Earth is a charming book about a grandma and her grandson gardening together. What is so nice about this book is the young boy’s ability to explore and discover on his own. The book shows the seasonal cycles of the garden as well as an interesting outcome. There is, after all, more than one way to do things. Recommended. and 10 Awesome Father-Son Activity Books as well. These sound like some wonderful books to share across the generations. Thanks for sharing with #WhatToReadWednesday. Hope to see you back again this week!